Hello there Loverlies! This is a quick blog post, but I had to share some nifty information for y'all! I am in the Open Your Bible launch team, which is a team to get the news out about this awesome new Bible Study! This Bible study is by She Reads Truth and Lifeway Women. She Reads Truth is normally bible studies that you can get in their app. (Which, they have some awesome bible studies) But the Open Your Bible will be a Print Only Study and will release on November 2nd! This study is great for group studies or just studying by yourself. It is seven sessions long and has six weeks of personal study. (AKA Homework) There will also be optional video sessions that you can watch that are 10 minutes long. They will be great for digging deeper into this study. The videos will be available via download at Lifeway, when the study releases on November 2nd. So mark your dates! 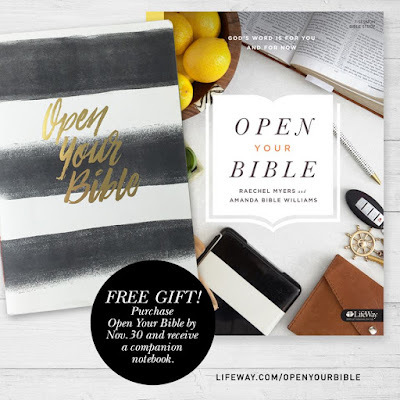 Another plus I must mention is, if you order this Bible study now through November 30th, you will receive a very cute FREE Open Your Bible companion notebook. After the 30th of November it will not be free, but you can still purchase the companion journal. I have a feeling this will be an awesome bible study! Have a Blessed Day!